ENDODAN Tablets also contain the following inactive ingredients: D and C Yellow 10, FD and C Yellow 6, microcrystalline cellulose and corn starch. 1 4.8355 mg oxycodone HCl is equivalent to 4.3346 mg of oxycodone as the free base. Oxycodone is a semisynthetic pure opioid agonist whose principal therapeutic action is analgesia. Other pharmacological effects of oxycodone include anxiolysis, euphoria and feelings of relaxation. These effects are mediated by receptors (notably Î¼ and Îº) in the central nervous system for endogenous opioid-like compounds such as endorphins and enkephalins. Oxycodone produces respiratory depression through direct activity at respiratory centers in the brain stem and depresses the cough reflex by direct effect on the center of the medulla. Aspirin (acetylsalicylic acid) works by inhibiting the bodyâ€™s production of prostaglandins, including prostaglandins involved in inflammation. Prostaglandins cause pain sensations by stimulating muscle contractions and dilating blood vessels throughout the body. In the CNS, aspirin works on the hypothalamus heat-regulating center to reduce fever, however, other mechanisms may be involved. ENDODAN tablets are indicated for the management of moderate to moderately severe pain. ENDODAN tablets are contraindicated in patients with known hypersensitivity to oxycodone or aspirin, and in any situation where opioids or aspirin are contraindicated. Aspirin is contraindicated for patients with hemophilia. Oxycodone can be abused in a manner similar to other opioid agonists, legal or illicit. This should be considered when prescribing or dispensing ENDODAN tablets in situations where the physician or pharmacist is concerned about an increased risk of misuse, abuse, or diversion. Concerns about misuse, addiction, and diversion should not prevent the proper management of pain. Respiratory depression is a hazard with the use of oxycodone, one of the active ingredients in ENDODAN tablets, as with all opioid agonists. Elderly and debilitated patients are at particular risk for respiratory depression as are non-tolerant patients given large initial doses of oxycodone or when oxycodone is given in conjunction with other agents that depress respiration. Oxycodone should be used with extreme caution in patients with acute asthma, chronic obstructive pulmonary disorder (COPD), cor pulmonale, or preexisting respiratory impairment. In such patients, even usual therapeutic doses of oxycodone may decrease respiratory drive to the point of apnea. In these patients alternative non-opioid analgesics should be considered, and opioids should be employed only under careful medical supervision at the lowest effective dose. ENDODAN tablets should be given with caution to patients with CNS depression, elderly or debilitated patients, patients with severe impairment of hepatic, pulmonary, or renal function, hypothyroidism, Addison's disease, prostatic hypertrophy, urethral stricture, acute alcoholism, delirium tremens, kyphoscoliosis with respiratory depression, myxedema, and toxic psychosis. ENDODAN tablets may obscure the diagnosis or clinical course in patients with acute abdominal conditions. Oxycodone may aggravate convulsions in patients with convulsive disorders, and all opioids may induce or aggravate seizures in some clinical settings. Following administration of ENDODAN tablets, anaphylactic reactions have been reported in patients with a known hypersensitivity to codeine, a compound with a structure similar to morphine and oxycodone. The frequency of this possible cross-sensitivity is unknown. Aspirin can cause fetal harm when administered to a pregnant woman. Salicylates readily cross the placenta and by inhibiting prostaglandin synthesis, may cause constriction of ductus arteriosus, resulting in pulmonary hypertension and increased fetal mortality and, possibly other untoward fetal effects. Aspirin use in pregnancy can also result in alteration in maternal and neonatal hemostasis mechanisms. Maternal aspirin use during later stages of pregnancy may cause low birth weight, increased incidence of intracranial hemorrhage in premature infants, stillbirths and neonatal death. The use of aspirin during pregnancy especially in the third trimester should be avoided. If ENDODAN tablets are used during pregnancy, or if the patient becomes pregnant while taking this drug, the patient should be apprised of the potential hazard to the fetus. Avoid aspirin in patients with severe renal failure (glomerular filtration rate less than 10 mL/minute). Patients receiving other opioid analgesics, general anesthetics, phenothiazines, other tranquilizers, centrally-acting anti-emetics, sedative-hypnotics or other CNS depressants (including alcohol) concomitantly with ENDODAN tablets may exhibit an additive CNS depression. When such combined therapy is contemplated, the dose of one or both agents should be reduced. The opioid abstinence or withdrawal syndrome is characterized by some or all of the following: restlessness, lacrimation, rhinorrhea, yawning, perspiration, chills, myalgia, and mydriasis. Other symptoms also may develop, including: irritability, anxiety, backache, joint pain, weakness, abdominal cramps, insomnia, nausea, anorexia, vomiting, diarrhea, or increased blood pressure, respiratory, respiratory rate, or heart rate. 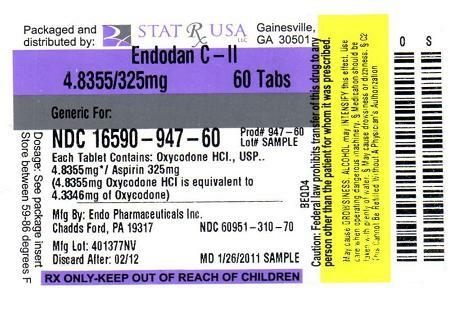 Patients should be aware that ENDODAN tablets contain oxycodone, which is a morphine-like substance. Patients should be instructed to keep ENDODAN tablets in a secure place out of the reach of children. In the case of accidental ingestions, emergency medical care should be sought immediately. When ENDODAN tablets are no longer needed, the unused tablets should be destroyed by flushing down the toilet. Patients should be advised that ENDODAN tablets may impair mental and/or physical ability required for the performance of potentially hazardous tasks (e.g., driving, operating heavy machinery). Patients should not combine ENDODAN tablets with alcohol, opioid analgesics, tranquilizers, sedatives, or other CNS depressants unless under the recommendation and guidance of a physician. When co-administered with another CNS depressant, ENDODAN tablets can cause dangerous additive central nervous system or respiratory depression, which can result in serious injury or death. The safe use of ENDODAN tablets during pregnancy has not been established; thus, women who are planning to become pregnant or are pregnant should consult with their physician before taking ENDODAN tablets. Nursing mothers should consult with their physicians about whether to discontinue nursing or discontinue ENDODAN tablets because of the potential for serious adverse reactions to nursing infants. Patients who are treated with ENDODAN tablets for more than a few weeks should be advised not to abruptly discontinue the medication. Patients should consult with their physician for a gradual discontinuation dose schedule to taper off the medication. Patients should be advised that ENDODAN tablets are a potential drug of abuse. They should protect it from theft, and it should never be given to anyone other than the individual for whom it was prescribed. Patients should be advised that ENDODAN tablets may cause or worsen constipation. They should discuss any past history of constipation with their prescribing physician so a management plan may be initiated. Patients receiving CNS depressants such as other opioid analgesics, general anesthetics, phenothiazines, other tranquilizers, centrally-acting anti-emetics, sedative-hypnotics or other CNS depressants (including alcohol) concomitantly with ENDODAN tablets may exhibit an additive CNS depression. When such combined therapy is contemplated, the dose of one or both agents should be reduced. Uricosuric Agents: Salicylates antagonize the uricosuric action of probenecid or sulfinpyrazone. Depending on the sensitivity/specificity and the test methodology, the individual components of ENDODAN tablets may cross-react with assays used in the preliminary detection of cocaine (primary urinary metabolite, benzoylecgonine) or marijuana (cannabinoids) in human urine. A more specific alternate chemical method must be used in order to obtain a confirmed analytical result. The preferred confirmatory method is gas chromatography/mass spectrometry (GC/MS). Moreover, clinical considerations and professional judgment should be applied to any drug-of-abuse test result, particularly when preliminary positive results are used. Salicylates may increase the protein bound iodine (PBI) result by competing for the protein binding sites on pre-albumin and possibly thyroid-binding globulins. Safe use of ENDODAN (Oxycodone and Aspirin Tablets, USP) in pregnancy has not been established relative to possible adverse effects on fetal development. Therefore, ENDODAN tablets should not be used in pregnant women unless, in the judgment of the physician, the potential benefits outweigh the possible hazards. Opioids can cross the placental barrier and have the potential to cause neonatal respiratory depression. Opioid use during pregnancy may result in a physically drug-dependent fetus. After birth, the neonate may suffer severe withdrawal symptoms. Aspirin may produce anemia, ante- or postpartum hemorrhage, prolonged gestation and labor, and oligohydramnios. ENDODAN tablets are not recommended for use in women during and immediately prior to labor and delivery due to its potential effects on respiratory function in the newborn. Aspirin should be avoided one week prior to and during labor and delivery because it can result in excessive blood loss at delivery. Prolonged gestation and prolonged labor due to prostaglandin inhibition have been reported. Ordinarily, nursing should not be undertaken while a patient is receiving ENDODAN tablets because of the possibility of sedation and/or respiratory depression in the infant. Oxycodone is excreted in breast milk in low concentrations, and there have been rare reports of somnolence and lethargy in babies of nursing mothers taking an oxycodone/acetaminophen product. 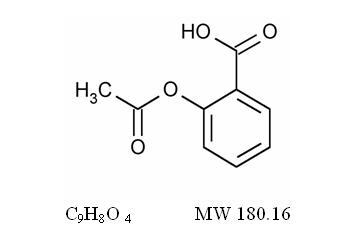 Salicylic acid has also been detected in breast milk. Adverse effects on platelet function in the nursing infant exposed to aspirin in breast milk may be a potential risk. Furthermore, the risk of Reye Syndrome caused by salicylate in breast milk is unknown. Because of the potential for serious adverse reactions in nursing infants, a decision should be made whether to discontinue nursing or to discontinue the drug, taking into account the potential benefits to the woman and the possible hazards to the nursing infant. ENDODAN tablets should not be administered to pediatric patients. Reye Syndrome is a rare but serious disease which can follow flu or chicken pox in children and teenagers. While the cause of Reye Syndrome is unknown, some reports claim aspirin (or salicylates) may increase the risk of developing this disease. Special precaution should be given when determining the dosing amount and frequency of ENDODAN tablets for geriatric patients, since clearance of oxycodone may be slightly reduced in this patient population when compared to younger patients. Serious adverse reactions that may be associated with ENDODAN tablet use include respiratory depression, apnea, respiratory arrest, circulatory depression, hypotension, and shock (see OVERDOSAGE). unspecified hemorrhage, purpura, reticulocytosis, prolongation of prothrombin time, disseminated intravascular coagulation, ecchymosis, thrombocytopenia. miosis, visual disturbances, red eye. Serious overdose with ENDODAN (Oxycodone and Aspirin Tablets, USP) is characterized by signs and symptoms of opioid and salicylate overdose. Oxycodone overdosage can be manifested by respiratory depression (a decrease in respiratory rate and/or tidal volume, Cheyne-Stokes respiration, cyanosis), extreme somnolence progressing to stupor or coma, skeletal muscle flaccidity, cold and clammy skin, pupillary constriction (pupils may be dilated in the setting of hypoxia), and sometimes bradycardia and hypotension. In severe overdosage, apnea, circulatory collapse, cardiac arrest and death may occur. Early signs of acute aspirin (salicylate) overdose including tinnitus occur at plasma concentrations approaching 200 mcg/mL. Plasma concentrations of aspirin above 300 mcg/mL are toxic. 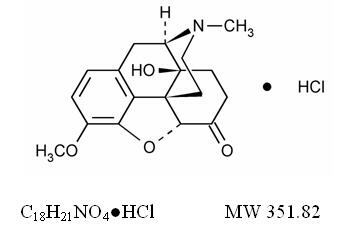 Severe toxic effects are associated with levels above 400 mcg/mL. A single lethal dose of aspirin in adults is not known with certainty but death may be expected at 30 g. For real or suspected overdose, a Poison Control Center should be contacted immediately. Dosage should be adjusted according to the severity of the pain and the response of the patient. It may occasionally be necessary to exceed the usual dosage recommended below in cases of more severe pain or in those patients who have become tolerant to the analgesic effect of opioids. If pain is constant, the opioid analgesic should be given at regular intervals on an around-the-clock schedule. ENDODAN tablets are given orally. In patients treated with ENDODAN tablets for more than a few weeks who no longer require therapy, doses should be tapered gradually to prevent signs and symptoms of withdrawal in the physically dependent patient. ENDODAN tablets are a Schedule II controlled substance. Oxycodone is a mu-agonist opioid with an abuse liability similar to morphine. Oxycodone, like morphine and other opioids used in analgesia, can be abused and is subject to criminal diversion. â€œDrug-seekingâ€ behavior is very common in addicts and drug abusers. Drug-seeking tactics include emergency calls or visits near the end of office hours, refusal to undergo appropriate examination, testing or referral, repeated â€œlossâ€ of prescriptions, tampering with prescriptions and reluctance to provide prior medical records or contact information for other treating physician(s). â€œDoctor shoppingâ€ to obtain additional prescriptions is common among drug abusers and people suffering from untreated addiction. Like other opioid medications, ENDODAN tablets are subject to the Federal Controlled Substances Act. After chronic use, ENDODAN tablets should not be discontinued abruptly when it is thought that the patient has become physically dependent on oxycodone. ENDODAN (oxycodone and aspirin tablets, USP), supplied as a yellow round tablet, with one face scored and the other debossed with â€œEndoâ€ and â€œ610â€.